THIS ITEM IS NOT AVAILABLE AT PRESENT. 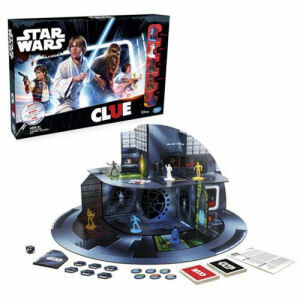 WE WILL NOT BE GETTING ANYMORE Star Wars Clue Game. From the Star Wars collection by Hasbro. Star Wars Clue Game. Which planet will Darth Vader and the Empire use the Death Star on Next? For 3 to 6 players. Ages 8 and up. Hasbro Star Wars Games shipping from Canada. No Surprise Border fees or Customs!